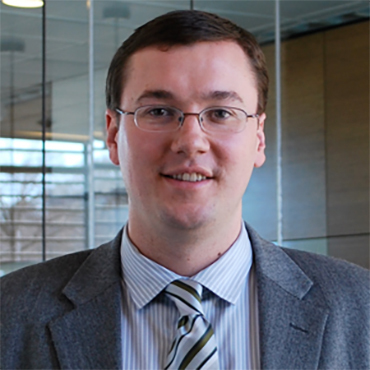 Home All Events Seminar Series 2018 – Ryan C. Hayward, Ph.D.
Multi-component polymeric systems exhibiting nanometer-scale phase separation hold importance in a wide variety of contexts, ranging from engineering plastics and elastomers, to membranes, to photovoltaic devices. In designing such materials, a key aspect to consider is how the domains of each component are connected in space. Our group has recently studied two examples that hold unique potential for controlling domain connectivity. In the first case, we consider self-assembly of randomly cross-linked copolymer networks, which provide three dimensionally co-continuous morphologies over wide ranges in composition and for a variety of constituent polymers. In particular, we focus on systems containing a rigid structural phase paired with a degradable phase as both a model system and a convenient method to prepare interconnected nanoporousmembranes. In the second case, we study the growth of nanocrystals of hole-transporting conjugated polymers and electron-transporting organic small molecules. Under appropriate conditions, the materials can be assembled into highly aligned hetero-crystals that permit electrons and holes in spatially orthogonal directions, yielding a new type of semiconducting behavior with potential in organic electronic devices and vapor sensors.